In 2010 Micromeritics will begin presenting a series of webinars that will highlight applications, theory, and instrumentation for a variety of materials characterization techniques. 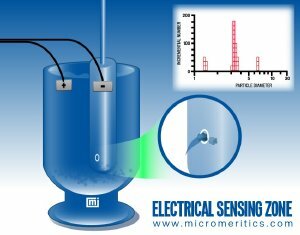 The first in this series of technical presentations will cover the Elzone electrical sensing zone particle size/count technique and its pharmaceutical applications with a live webinar on February 4 at 11 AM EST. Unlike many particle sizing techniques, electrical sensing zone (Coulter principle) data are unaffected by samples composed of particles having an assortment of optical properties, densities, and shapes. Size distribution is determined by analyzing, one at a time, each particle from a representative subset of the introduced sample quantity. This particle-by-particle analysis technique provides accurate particle count data and, when combined with Micromeritics' precision volume metering option, provides accurate number concentration data. Micromeritics' Elzone quickly and accurately determines the size, number, concentration, and mass of a wide variety of materials. To register for this informative webinar click on https://micromeriticsevents.webex.com/micromeriticsevents/onstage/g.php?t=a&d=597364441 or paste this link into your web browser.